Fans to weigh in on Final Four MVP voting! In its everlasting quest to find new ways to interact with its fans, Euroleague Basketball will take that one step forward during the Final Four. EuroLeague followers will be able, through Twitter, to vote for the players they think deserve to be MVP at the Turkish Airlines EuroLeague Final Four. 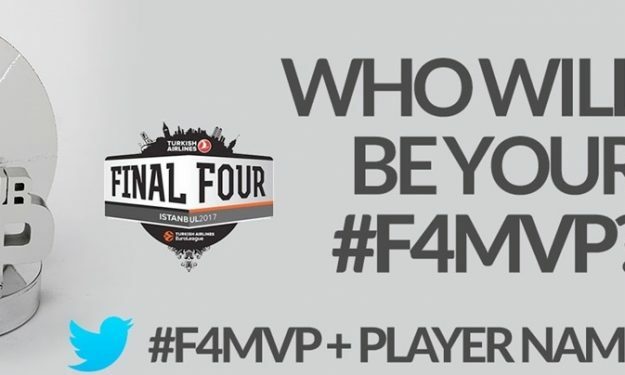 The voting will be active during the semifinals and championship game, and in order for their votes to count, fans will have to tweet #F4MVP + the name of the player from the winning team that they are voting for, using his last name or his official Twitter handle. The votes of the fans will make up a portion of the final tally. In order to follow the results in real time, fans can visit f4mvp.euroleague.net, where they can see how the voting progresses. And when the voting closes, the final result will be taken into account together with the voting by accredited media at the Final Four to name the 2017 Final Four MVP.